Another day, another Groupon. This time I had to drag The Marinater all the way out to North Hollywood, which was a lot like going to another country. Los Angeles is a huge place. Parking was free, and Eat That Burger was located in the same strip mall as a Mexican bakery, so I was able to bring some baked treats home to Happy Meal. The Groupon was for $25, and it was a challenge to spend that much. We ordered a couple of the generous Back To Back burgers--double meat and double cheese ($3.99), fries, and some sodas. Our meals were ready in about 10 minutes. 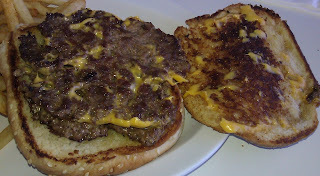 I did not have high expectations of my cheeseburger. I was pleasantly surprised. The Beef: The burger patties were in the 3.5-ounce range. The cut was an 80/20 Chuck sourced from Restaurant Depot. The beef was fresh and not frozen. The burger was strongly beefy and it was juicy. It was an uncomplicated patty in terms of flavor, but it was fresh and it was served hot. No funk, no aging, no blood. The mouth feel was firm without being chewy. For the price, the beef was a winner. The Seasoning: I detected just the right amount of salt on my burger patties at Eat That Burger. The Sear: They nailed it. The irregular patties were nicely seared on a very hot griddle. The sear complemented the hearty beef and savory notes. The Preparation: The burgers were cooked to a piping hot and juicy Well-Done. The burger patties were formed loosely by hand during the morning prep shift. 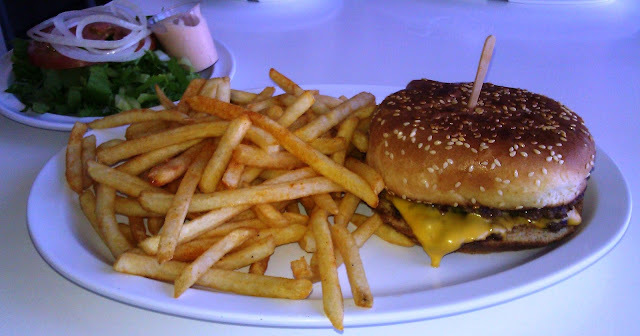 The Cheese: The cheese choices at Eat That Burger were American and........just American, and that was fine with me. American cheese was exactly right for this unassuming cheeseburger. The American cheese was gooey, savory, creamy, and provided just the right amount of iron to the bite. The cheese worked its way into every bite, and it was welcomed there. The Bun: The bun was a standard, seeded, sweet, yeasty, hamburger bun. It was moist, and it stood up to the burger just enough to contain the juices and the cheese but without contributing any breadiness. The bun was well-toasted, and it provided a little crunch to go along with the sear on the burger patties. The Meat To Bun Ratio: This was simply perfect. The Fries: The fries at Eat That Burger were the frozen, par-cooked, peel-off, and bagged variety. The fries were just fine. They were nicely crisped and well-seasoned. $1.99 for an endless portion was just a lot more fries than anyone needs, but the value was there. The Toppings: The tomato slice was on the green side. The Romaine lettuce leaf was fresh and crisp. Eat That Burger provided a couple of sauces. The one for the fries was mayo, garlic, tomato, and parsley. This sauce was curiously fresh and refreshing. It was perfect on my cheeseburger. The Value: The value was pretty ridiculous. With the Groupon, the value was just embarrassing. For 25 bucks, I got 3 big cheeseburgers, several orders of fries, a couple of drinks, and some jalapeno/cheeseburger in a tortilla, which was fantastic. Eat That Burger? You're darn right you should go to Eat That Burger. At the time of this review, they had been open for just over a year, and their quality and standards were rock solid. The value was huge, and the flavors were good. Burger Review : A darn fine cheeseburger for an amazing price at Eat That Burger. I like the bun on this burger. A flat, Burger King kinda bun. It was very satisfying. Happy Meal enjoyed the burger that I brought home. I also gorged on the jalapeno cheeseburger wrap, and it was damn good.